The 20 cm long Rovers® Cervex-Brush® is made of polyethylene and contains 57 semi-circular plastic bristles of various lengths. 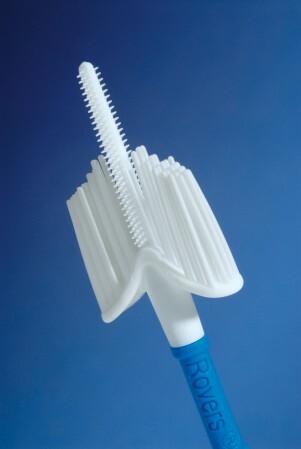 The shape of this device allows the top edges of the brush to follow the contours of the cervix while the longer middle bristles reach the endocervical canal. The shorter bristles touch both the ectocervical area and transformation zone. This device collects cell from the entire required sampling area of the cervex, therefore, it is not necessary to use a spatula in conjunction with this product. The Rovers® Cervex-Brush® can be used for either the conventional Pap smear or in conjunction with the “monolayer prep” process. The Rovers® Cervex-Brush® should not be used during pregnancy. Rovers Medical Devices has engineered a new Pap smear collection device which combines the important features of the original Cervex-Brush® with the benefits of the EndoCervex-Brush®. The convenient Cervex-Brush® Combi provides doctors and nurses the option of a simultaneous Pap smear collection with a single device insertion. 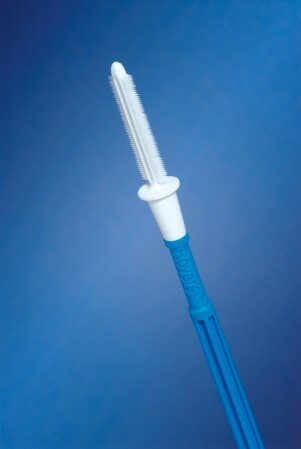 The Cervex-Brush® Combi will collect both ectocervical and endocervical cells from patients. Initial studies with the Cervex-Brush® Combi resulted in favorable collection efficiencies. There were almost twice as many abnormal smears detected when sampling was done using the Cervex-Brush® Combi as with the Cervex-Brush®. The Rovers® Cervex-Brush® Combi should not be used during pregnancy. Rovers® EndoCervex-Brush® is a one piece cytology brush designed to optimize cellular yield in Pap smear, Chlamydia, and Gonorrhea testing. The EndoCervex-Brush® provides 600 separate collection bristles for the simultaneous collection of cellular material. The stiff yet flexible brush head is made of polypropylene and has a protective tip to enhance the overall collection process and to reduce injury and bleeding. The brush head is detachable after collection. This device can be used for the conventional Pap smear or in conjunction with the “monolayer prep” processes. Contra-indications: The Rovers® EndoCervex-Brush® should not be used during pregnancy. Based on customer requests and technical needs in relation to the development of the Cervex-Brush® Combi, the EndoCervex-Brush®-S was developed. 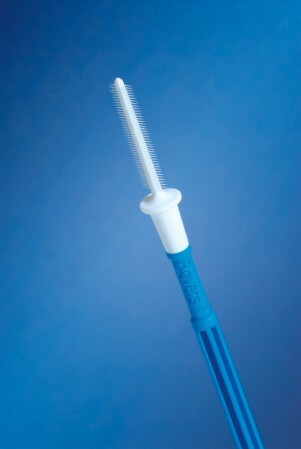 The technology step was quite significant as the product can be seen as a small version of the EndoCervex-Brush®. The hairs are very tiny and the thin-hair technology was developed by Rovers Medical Devices and has been patented. In relation to the Cervex-Brush® and the EndoCervex-Brush® the EndoCervex-Brush®-S can be positioned easily. 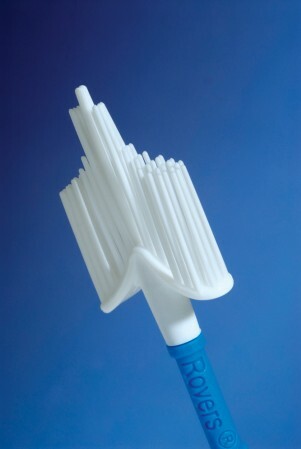 The EndoCervex-Brush®-S is a fine soft product that can be turned even under an angle. It does not contain any sharp edges or front end and will therefore cause less bleeding. Contra-indications: The Rovers® EndoCervex-Brush®-S should not be used during pregnancy.